Ethereum is holding firm around the $230.00 level on Tuesday, with the second largest cryptocurrency retaining it’s place as the second largest cryptocurrency as it's nearest rival Ripple comes under selling pressure. The ETH/USD pair has been fairly resilient on pullbacks as of late, with buyers stepping in towards the $200.00 benchmark since last week. The popular token has failed to make any strong upside moves since meeting strong technical resistance from the $255.00 level during late September, hence we have seen tepid range-bound trading. It must be noted the bearish head and shoulders pattern still looms large over the ETH/USD pair. 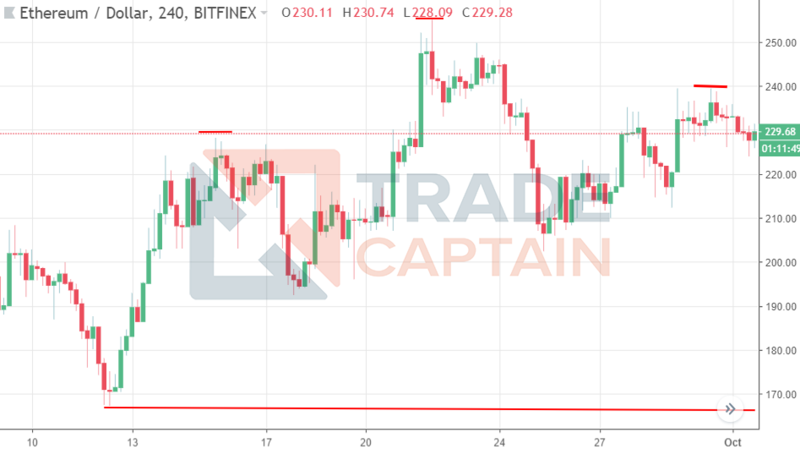 Overall, the pair appears poised for a sizeable technical break, with buyers ideally needing to pierce the $255.00 level and sellers needing to convincingly break the $200.00 level once again. In the immediate-term I am watching the mood of the broader market for clues as to the next directional mood. I believe if we need to see a definitive sentiment shift in order for Ethereum an numeorus other cryptocurrencies to break away from range-bound trading conditions. What's your view on Ethereum? Trade it with a REGULATED BROKER. This morning, the Indian Rupee (USDINR), reached a new 2018 high vs. the Dollar, as the price reached a high of 73.69. The latest rout in the Indian Rupee follows a few days of consolidation in the 71.44 to 72.96 range and is on the heels of broad-based dollar strength. A new factor to consider is the current sell-off in Italian stock and government bond markets, which is driving up risk-aversion as traders sell the Euro, stock markets, and buying the Japanese Yen. Technically, I have been bullish since August when the price completed an ascending triangle pattern by successfully breaching its 2016 high of 68.92. The pattern is derived by drawing an upward sloping trendline via the 2014 and 2018 lows and adding a horizontal resistance level via the September 2013, February 2016, and November 2016 highs. 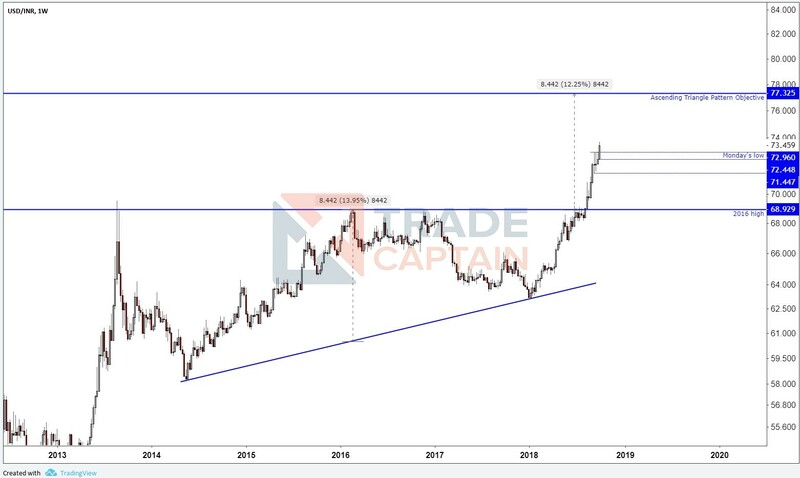 The pattern’s objective is derived by adding the difference between the February 2016 high and the upward sloping trendline to the 2016 high, and the pattern is suggesting that the Indian Rupee might reach the 77.32 level. In the short-term, the break to the smaller range of 71.44 to 72.96 resumed the longer-term upward trend to 77.32, and the short-term trend will remain bullish as long as the price trades above Monday’s low of 72.44. If the price tries to re-enter the 71.44 - 72.96 range I suspect traders will see this an opportunity to long the USDINR pair with stops below Monday’s low. Follow Alex on Twitter, and join Tradecaptain on Youtube. The British pound has taken another leg lower against the greenback, as the current risk-off trading sentiment in financial markets worsens. The U.S. Dollar and the Japanese yen currencies have received a fresh bid, with traders seeking out safe-haven currencies. Brexit has been the main driver of the GBP/USD pair lately, despite all the recent comments and bluster from British officials, uncertainty persists towards Brexit as the EU have yet to come up with a counter-offer since rejecting British PM Theresa May’s Chequers plan. Softer than expected PMI construction data from the UK economy this morning is also not helping the GBP/USD pair, as the rapid unravelling from yesterday's spike-high continues. 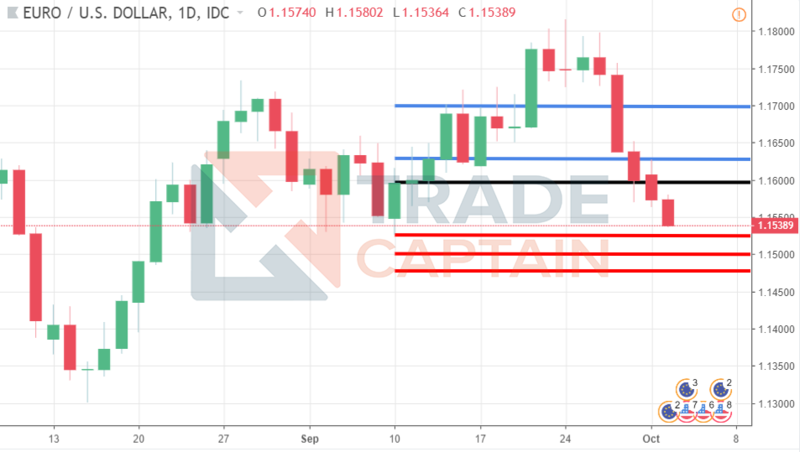 The GBP/USD pair is quickly slicing through key technical support after taking out the 1.3000 barrier during the European session, we should expect downside pressure to remain while price trades below this key psychological level. Below the 1.2950 level, the 1.2900 level offers key support, with the 1.2860 level the major level to watch below the 1.2900 handle. 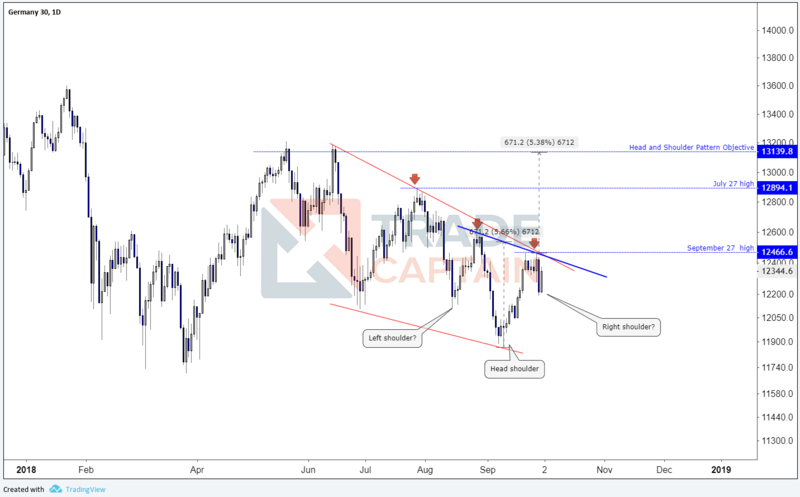 Key resistance above the 1.3000 level is found at the 1.3016 and 1.3046 level. What's your view on the GBP/USD? Trade it with a REGULATED BROKER. Watch today's market update video for a quick update on the world's major financial markets and economic events. 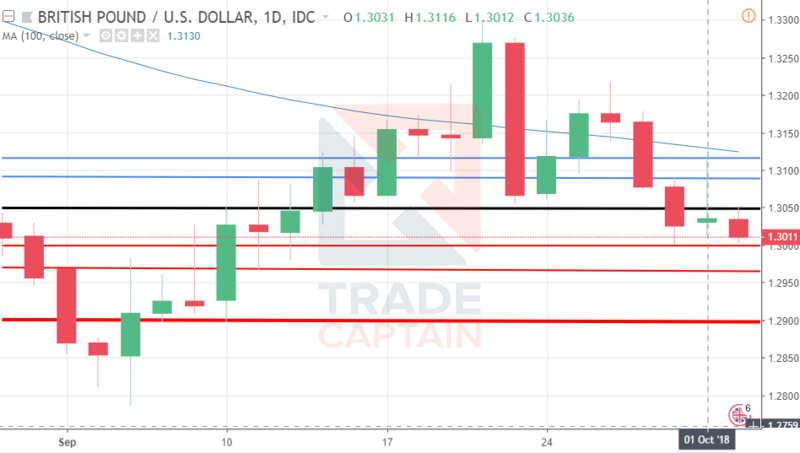 EURUSD challenges its June 21 low at 1.1509, and a break to this level might open the door for further losses in the days ahead. Gold prices remain bearish, but lower stock markets and a stronger Japanese Yen suggests that Gold prices are supported on an increase risk-aversion. Bitcoin prices remain range bound. WTI Crude oil prices have risen to a new 2018 high, and I suspect traders will be booking profits, and wait for a correction to obtain a better risk-reward ratio before increasing their bullish exposure. S&P 500 corrects lower, while DAX 30 remains bearish. Follow Alex on Twitter for more updates like this, and join Tradecaptain on Youtube. The U.S. Dollar Index is surging higher this morning, with price now trading at it’s highest level since September 5th. Bulls are likely aiming for the September trading high, around 95.75, a clear break above this key area may just prompt the next leg-higher towards the 96.00 mark. Solid U.S. economic data and move lower in some of the major currency pairings are helping to boost the U.S. Dollar, with the greenback becoming a major beneficiary of euro weakness on this week. The U.S. Dollar Index has made a significant recovery since tagging the 93.80 level just some eight trading days ago. 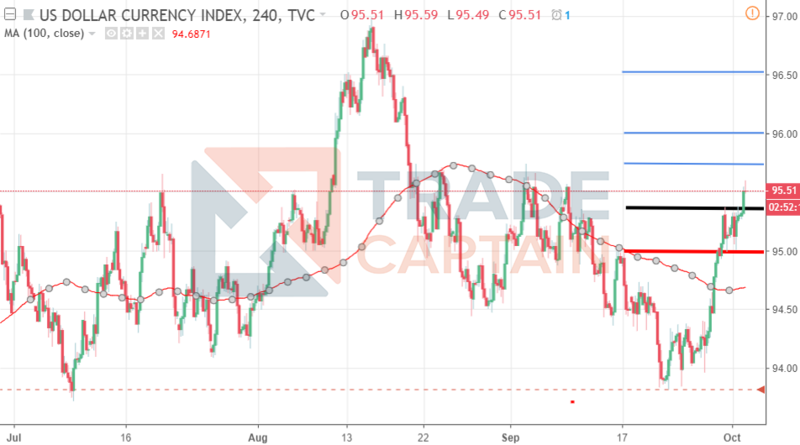 Looking at the technicals for the U.S. Dollar Index, key resistance above the 95.75 level is found at the 96.00 and 96.50 level, with the 97.00 level the ultimate target medium-term bulls need to break. To the downside, the 95.35 and 95.00 levels are the main support areas to watch on pullbacks, with the 94.70 level the foremost technical support prior to the 94.40 level. What's your view on the U.S. Dollar? Trade it with a REGULATED BROKER. The U.S. Dollar has started to trade lower against the Japanese yen as the risk-sensitive pair performs a much needed technical pullback. 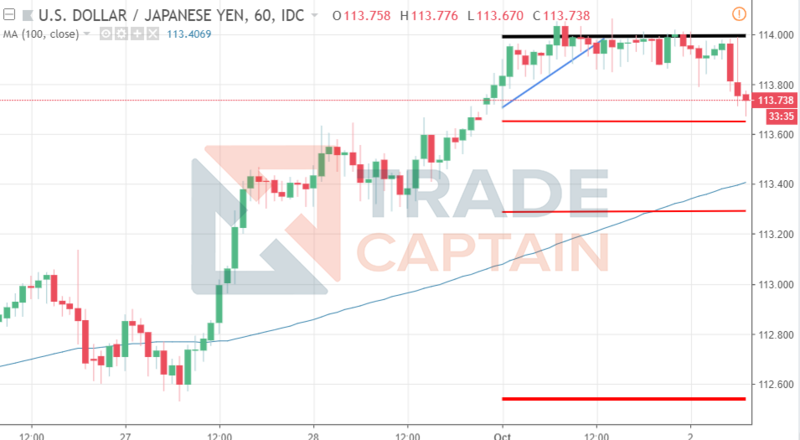 The USD/JPY repeatedly struggle to hold onto the 114.00 handle, after the pair hit an eleven-month trading high on Monday. Asian equity markets came under pressure earlier today, with the Hang Seng tumbling over two per cent intraday and the Nikkei225 receding earlier gains. The Nikkei had started to look toppy, as it hovered around the best levels in over twenty-seven years. Yesterday I noted that the USD/JPY pair may correct lower as buyers were unable make headway past the 114.00 resistance level. Price is fast approaching the 113.60 area, with the next support zone found area the last bullish swing-low, around the 113.30 level. It remains to be seen if the buyers will swoop-in on a minor correction lower, or if we will see more protracted losses towards the 113.00 area. Key support below the 113.00 level is found close to the 112.60 level. To the upside, key resistance is now found at the 113.80 and 114.06 levels, with the 114.44 and 114.60 levels extended intraday resistance. What's your view on the USD/JPY? Trade it with a REGULATED BROKER. The British pound is under pressure against the greenback this morning, as price rapidly approaches the psychological 1.3000 level. The GBP/USD pair has seen a fast change of direction, after spiking above the 1.3100 handle on bullish Brexit news on Monday. Interestingly, we have also seen a fairly sizeable shift in retail traders going long the GBP/USD pair according to today's TradeCaptain Sentiment Indicator. 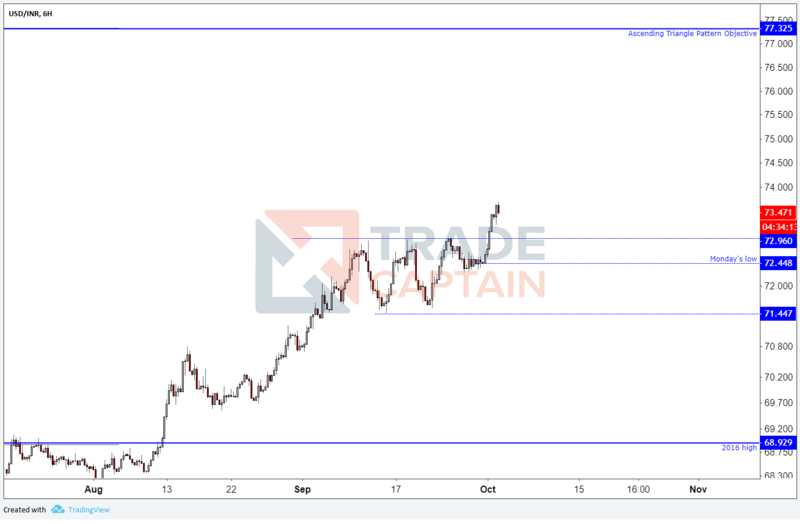 Data today shows a sharp increase from yesterday, with seventy-one per cent of retail traders now long the pair and just twenty-nine per cent of traders willing to short the GBP/USD pair. Retail traders tend to be on the wrong side of the trade when a new trend or direction breakout emerges, so the Forex Sentiment Indicator can be used as a contrarian indicator. With that being said, when a financial instrument is clearly range bound on the daily chart, then retail traders tend to get it right. Looking at technicals, a clear break of the 1.3000 handle should speed up the decline, with the September 11th trading level likely to offer support, at 1.2970. Below the 1.2970 level, key support is likely to come from the 1.2900 level, which is another important swing-low from last month before the rally to 1.3300. 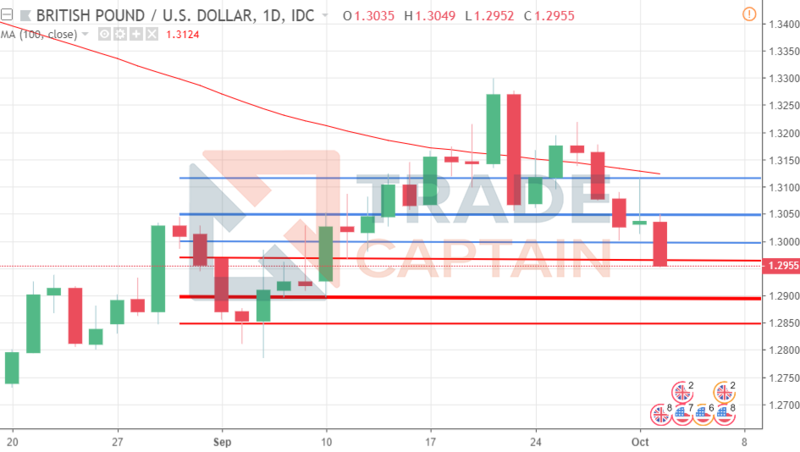 To the upside, key resistance comes from the daily-high, 1.3047 and the 1.3080 level, as ever ongoing Brexit news and the U.S. Dollar Index are likely to guide the GBP/USD pair's intraday directional bias. The euro has fallen to it’s lowest trading level against the U.S. Dollar since September 10th in early Tuesday trading, as the slide in the pair shows few signs few signs of abaiting. The EUR/USD pair has come under pressure due to a renewed bid in the U.S. Dollar Index. Technically, a sustained break below the September 10th trading low, at 1.1525, should inspire an impending test of the 1.1500 handle. Traders will remember well the struggles that the EUR/USD pair had previously faced when trying to break below the 1.1500 technical barrier. Below the 1.1500 level, the key support areas that I am watching are the August 21st low, at 1.1478, and then the 1.1430 level, which I suspect will be the first line of defence before the 1.1400 level, if indeed we do see a protracted drop below the 1.1500 handle. News that the EU is unhappy with the Italian budget and rising Italian bond-yields is also creating pressure on the single currency. If we see one of the major credit rating agencies downgrading Italy, we could easily see the EUR/USD pair tumble on the news. Bulls failed around the 1.1625 region yesterday, this now becomes the key resistance areas buyers need to break above the 1.1600 level in order to make a realistic challenge at the 1.1650 level, which is another key resistance area. What's your view on the EUR/USD? Trade it with a REGULATED BROKER. Moments ago, West Texas Intermediate (WTI) crude oil spiked to the proximity of its 2018 high at $75.24. I suspect that we might see profit taking around the 2018 high as the price had had a healthy 12% rally since the first week of September when the price dipped to $66.80. However, looking beyond the near-term overbought conditions, I suspect prices might reach $77.99, followed by $79.46 as projected in my September 14 update. DAX 30 drifts lower following a test of a downward sloping trend line, but with other U.S. stock markets being bullish, is it not time for the DAX 30 to catch up? 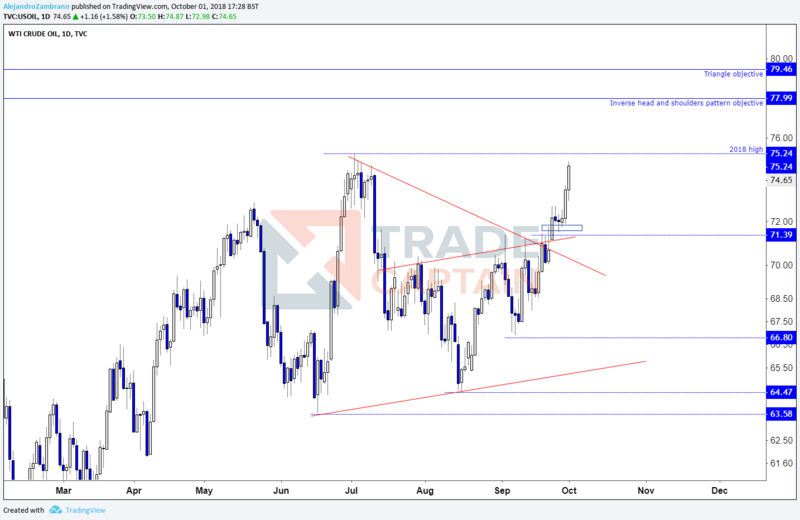 Last week on September 27, the DAX 30 turned lower from the 12466 level as it reached a descending trendline that intersects the June 15 and July 27 highs. The downward sloping trendline could be part of a falling wedge pattern as seen in the chart below and is a pattern that hints of a potential end of the downtrend. For the market to turn bullish per the wedge pattern, the price will need to break the trendline and the September 27 high. However, a better sign that a low could be forming is the on-going inverse head and shoulders pattern. Here, the August 15 low of 12116, and September low of 11862 are the “left shoulder” and “head” of the pattern, while the “right shoulder” is still under development. The “neckline” goes via the August 28 and September 27 highs. The head and shoulders pattern has, therefore, the same breaking point as the falling wedge pattern, and this strengthens the importance of the September 27 high. Time will tell if we are indeed dealing with an inverse head and shoulders pattern, if it is, then the pattern suggests that the price could reach 13139 on a break to the September 27 high.